Though he’s a star basketball player, Michael Linklater is far from a household name. The 33-year-old, who is Cree and a member of Saskatchewan’s Thunderchild First Nation, has held a prestigious position for the last couple of years. He’s the top-ranked player from all of the Americas (North, South and Central) in 3-on-3 basketball. Linklater is also currently ranked Number 13 in the world. 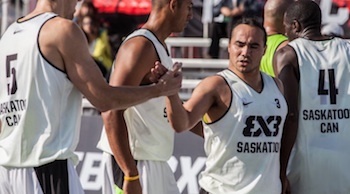 Despite not being recognized wherever he goes, Linklater has spent the past four years playing in various 3-on-3 tournaments around the globe. There’s even a world tour that he plays in, sanctioned by the sport’s global governing body FIBA (International Basketball Federation). The fact that he does so in relative anonymity does not seem to bother Linklater. Linklater believes the popularity of 3-on-3 basketball is ready to explode. The sport is currently under consideration of whether to be included in the 2020 Summer Olympics in Tokyo. “This is going to be big when the announcement is made,” Linklater said, adding he is anticipating a positive decision from the International Olympic Committee later this year. Linklater believes Olympic inclusion for the sport will spark significant growth, much like beach volleyball experienced when it was added in 1996. “Now beach volleyball is one of the higher watched events at the Olympics,” he said. Though there are 3-on-3 events around the world now, Linklater is not making a living simply by playing in those. Winning teams at FIBA tour events take home $10,000. Linklater plays the majority of his tournaments with a team called Team Saskatoon. He is the only Native on the squad. His teammates are Michael Lieffers, 29, Nolan Brudehl, 26, and Willie Murdaugh, 46. Though there are four members of the squad, only three play at a time. Matches in 3-on-3 basketball are played on a half court and feature 10 minutes of stop time or conclude when one team reaches 21 points. Linklater, who also holds U.S. citizenship, has competed in various American events in recent years with other teammates. Success at those events has helped to boost his individual world ranking. Despite his success, Linklater has announced this will be his final year on the FIBA world tour. Plus, he is finding it increasingly difficult to juggle all that is going on in his life. For the past three years he has been working as a recreation co-ordinator at the White Buffalo Youth Lodge in Saskatoon. Plus he’s helping his common-law partner raise five children, ranging in age from five to14. Linklater’s basketball career included starring with the University of Saskatchewan Huskies. He captained the team to a national university title in 2010. He then played one season of pro with the Edmonton Energy in the International Basketball League. He was content playing just one season with the Energy. Linklater added there was a huge difference from basketball in the university ranks and the pro level. And not simply in terms of calibre. After his one season with the Energy, Linklater had enough of the pro ranks. And he wasn’t keen to possibly head overseas and play in a European circuit because he knew he would be required to help out his growing family at home.